1. Pre-heat oven to 185°C/170°C fan/gas mark 4. 2. Line the base and sides of a 23 x 33cm baking tray/Swiss roll tray with non-stick baking parchment. 3. Place the eggs and caster sugar into a large heatproof mixing bowl, place the mixing bowl over a pan of simmering water, ensuring the water does not touch the base of the mixing bowl. Whisk together until thick, pale, light and fluffy. If mixing in a stand mixer or with an electric handheld whisk, there’s no need to use simmering water, this is just to help speed up the process of whisking by hand. 4. Sift in the flour, salt and spices and gently fold into the eggs. 5. Add the grated carrot, orange zest and olive oil, lightly fold all together until smooth. 6. Pour the mixture into the prepared tin, use the back of a spoon to smooth the mix to create a nice even layer. 7. Bake for 10 - 12 minutes until golden and the sponge springs back to the touch. 8. Once the sponge is baked and is still warm dust the top with caster sugar and, working from the shortest edge, roll the sponge and the paper tightly into a roll. Allow to cool. 9. Whilst the sponge is cooling prepare the filling place the cream cheese into a mixing bowl, sift in the icing sugar and whisk to combine. 10. Once cooled carefully un-roll the sponge and spread over the filling in a nice even layer. 11. Use the Paper underneath to roll the sponge back into a tight roll. 12. Roll the sponge off the paper and onto a serving tray. 13. Store the roulade in the fridge until ready to serve to allow the filling to firm up- this will make the roulade much easier to cut. 14. 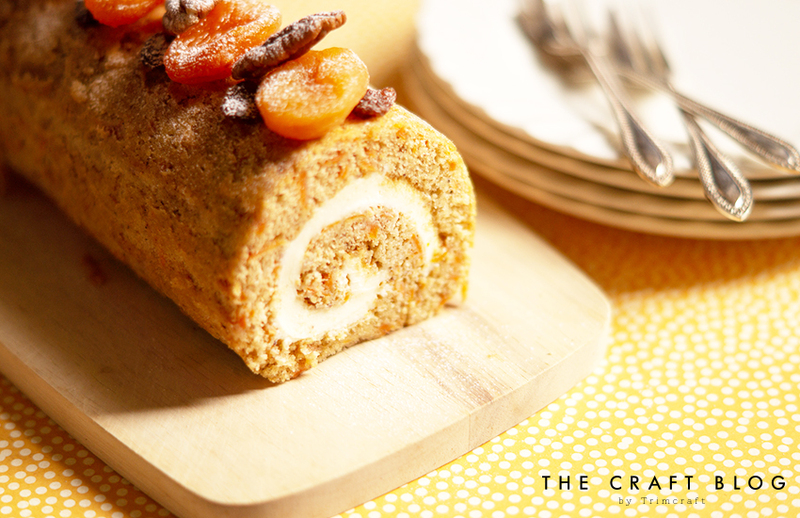 For an extra flourish, the roulade can be decorated with nuts and dried fruit. A dusting of icing sugar or perhaps a little more of the cream cheese filling drizzled over the top will work well too. - The roulade can be made in advance then stored in the fridge for 5 days or frozen for 1 month. - For a twist on the recipe, replace carrots with pumpkin, beetroot or even parsnip- any root vegetable will work well. - Sultanas and/or chopped nuts can be mixed into the filling also for a little extra texture and crunch. Will you be making Elle’s carrot cake roulade? We’d LOVE to see if you give these a try, so don’t forget to #Trimcraft and tag @elle_jane_ when uploading to social media, and to share your yummy makes in the Inspiration area.